Microsoft has been distributing copies of the next version of Office to partners and testers and although less glamorous than its operating system counterpart, Windows, the corporation's business suite is still one of the biggest (if not the single biggest) revenue stream for the company. Sources told The Verge that the "Office Technical Preview", which has yet to be name, will feature a "Tell Me" helper, similar to the one found in its Office Online apps and to the much-maligned Clippy. 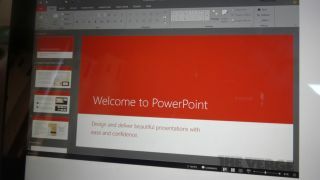 Screenshots of Office 16 (which could become Office 2015) show no change to the user interface - the Ribbon UI still is there - but there will be a new dark/black colour theme, one that will be introduced due to popular demand. The Verge also suggests that Microsoft will add automatic image rotation to Office documents and additional sync options for Outlook email client. Expect the change log to be significantly longer than this though as the momentum gradually shifts from the desktop to online and mobile. The current version of Office saw the introduction of a subscription model together with tighter integration with Microsoft's online storage service, OneDrive. Expect Office 2015 to feature during the Microsoft "Windows 9" event, one that will be held on 30 September.